I came to violinmaking through my woodworking. I was 8 or 9 when I began making things with wood. Over the years I've designed and made most of my own furniture as well as a few pieces for others. I became intrigued with violins after seeing a magazine article in 1981 that showed how they are entirely crafted by hand. By the late 80s I was reading and gathering information about how to make my own violin. My first violin and bow were completed in 1991. I was working as an engineer in a biochemistry research lab at the time. While that violin was okay as a student instrument, some things did not seem right about it. I didn't have access to other violins that I could learn from, so trying to make another seemed futile. A life change in 1997 brought me to Portland, and a fortuitous series of events led me to a job at a violin shop. After more than two years at that shop, I realized I had to be my own boss. I've been making and repairing instruments on my own since January 2001. 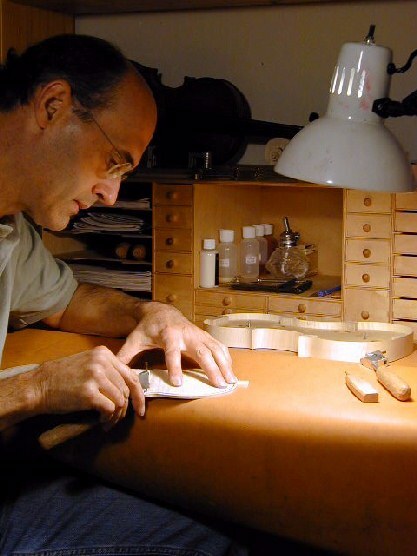 The experience of working on a wide variety of instruments at the violin shop was an important part of my learning. Just as important has been my broad education in science and engineering. I believe this allows me to see past the dogma that pervades the field and to apply rational thought to the complexities of this instrument.